Speaking Wednesday in the foyer of the Vermont Statehouse, Republican governor-elect Phil Scott called his 8.6 percentage point victory over Democrat Sue Minter a "mandate" for his agenda of fiscal moderation. There can be no doubt that Scott won a mandate to govern. Unofficial results from the Secretary of State's Office show that he defeated Minter by a resounding 27,555 votes — or 52 to 43.4 percent. A town-by-town analysis conducted by Seven Days demonstrates that his victory cut across nearly every corner of the state: He won 11 out of 14 counties and 193 of 246 towns and cities. But the message from the electorate appears more nuanced than Scott would have it. The same voters who sent a moderate conservative to the governor's office also dispatched a liberal activist, Sen. David Zuckerman (P/D-Chittenden), to the lieutenant governor's office — and wholeheartedly embraced the rest of the Democratic slate. In the legislature, Democrats held on to their near-supermajority status in the Vermont House and picked up two additional seats in the Vermont Senate, leaving Republicans with just seven out of 30 positions in the upper chamber. If anything, the results of the 2016 election demonstrate that Vermonters, as always, are perfectly willing to split their tickets. Take Essex, which cast the second-greatest number of ballots in the state. There, Scott won 1,305 more votes than Minter, while Zuckerman picked up 755 more than Republican lieutenant gubernatorial nominee Randy Brock. The town backed Democratic attorney general candidate T.J. Donovan and Sen. Patrick Leahy (D-Vt.) by large margins over Republican opponents — and voted for Democratic presidential nominee Hillary Clinton over Republican president-elect Donald Trump 64 to 29 percent. Essex also tossed out Republican incumbent Rep. Paul Dame (R-Essex Junction) in favor of a Democrat. If Scott's victory was broad, Trump's rejection by Vermont voters was overwhelming. The president-elect won just 29.8 percent of the vote, compared to 55.7 percent for Clinton. Indeed, Clinton won 11,765 more votes in Vermont than Scott did. Trump won more votes than Clinton in just 61 of 246 Vermont towns and cities. (They tied, 56 to 56 votes, in West Haven.) The Republican won an outright majority in just 32 towns — most of them in the Northeast Kingdom counties of Essex and Orleans. Trump found the most support in the tiny burgs of Holland (65 percent), Searsburg (63 percent), Lowell (63 percent), Morgan (62 percent) and Victory (60 percent). In 22 Vermont towns, Trump won less than 20 percent of the vote. Norwich, where Clinton campaign manager Robby Mook grew up, voted 88 to 8 percent for Clinton. Trump's next weakest towns included Montpelier (10 percent), Burlington (11 percent), Weybridge (13 percent) and Putney (14 percent). Of the state's 421,629 registered voters, nearly 69 percent turned out to vote Tuesday. The town of Windham took the prize for highest turnout, at 91 percent. Only 46 percent of Newport voters showed up. 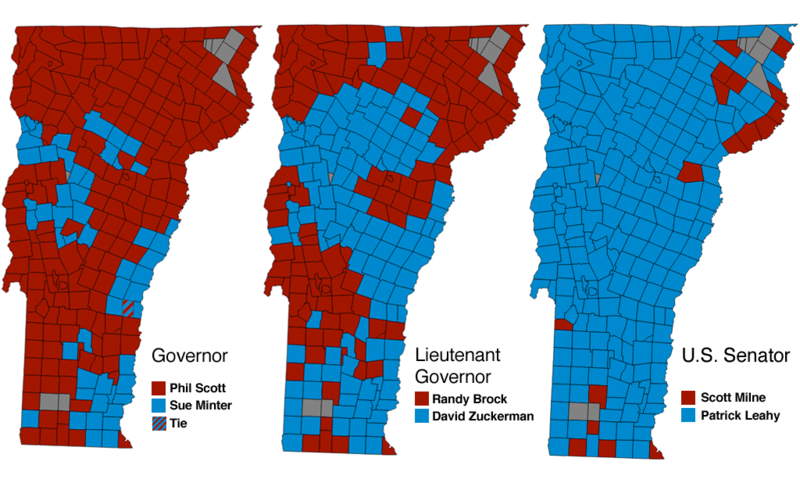 In the gubernatorial race, Scott won all but Chittenden, Windham and Windsor counties. He drew his greatest strength from Rutland County, where he won 8,286 more votes than Minter, and Franklin County, where he beat her by 8,087 votes. In Washington County, where both candidates live and which cast the second greatest number of ballots in the state, Scott won by a 3,224-vote margin. Minter performed best in liberal Windham County, netting 5,288 votes over Scott. She narrowly prevailed in Windsor County, another Democratic bastion, with just a 735-vote advantage. In Chittenden County, by far the most populous region of the state, Minter failed to run up the numbers the way any winning Democrat must. She won 53 percent of the vote there, winning by a net of 4,713 votes. The Democratic gubernatorial candidate's best towns and cities mirrored the presidential race: Norwich (75 percent), Putney (72 percent), Brattleboro (71 percent), Marlboro (71 percent) and Burlington (68 percent). She won by the most votes in Burlington (7,918), Brattleboro (2,965), Montpelier (1,654), Norwich (1,267) and South Burlington (977). In total, only 52 municipalities went Minter's way. Scott's strongest support came from Brunswick (83 percent), Irasburg (75 percent), Holland (76 percent), Granby (69 percent) and Barre Town (74 percent). He netted the most votes in Barre Town (2,373), Milton (2,008), Rutland City (1,579), Essex (1,305) and Colchester (1,294). The third candidate in the race, Liberty Union nominee Bill Lee, took 2.8 percent of the vote overall. He did best in Searsburg, where 10 percent backed the retired Red Sox pitcher. Minter struggled to win many towns and cities where Democrats otherwise prevailed. In 210 municipalities, both Leahy and Donovan defeated their respective Republican opponents, Scott Milne and Deb Bucknam. Of those, 116 voted for Zuckerman, while only 52 backed Minter. Listless in the Legislature: Why Has the 2017 Session Been So Sleepy?